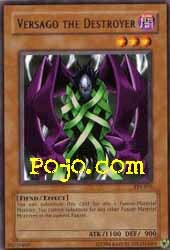 Effect: You can substitute this card for any one Fusion-Material Monster. You cannot substitute for any other Fusion-Material Monsters in the current Fusion. Well, there are 4 Fusion Material replacement monsters at the moment; Versago, Goddess Of The Third Eye, Beastking of the Swamps and Mystical Sheep #1. This guy has 100 less ATK & DEF than GotTE, but she's a Light type and Versago is Dark, making him a bit more playable and Tomatoble too, but I guess GotTE is Shining Angelable but still, Dark type monsters are more favorable than Light at the moment unless you're playing a straight Light Deck which I have seen become more playable lately. All these monsters are from Tournament Packs though, so If you didn't pull or trade one yet, the only place to really find them that I've seen are on the Internet, my local card shop doesn't even have them. Now for the actual stats... 1100/900... Obviously this card is really only used for its effect and not much as a field play monster. Since you can fuse monsters from your hand it never has to reach the field to begin with, and being able to replace ONE fusion material monster can help out more than most think. Like if you want to Summon Last Warrior but don't want to put Maryokutai in your deck, or Summon TER without putting the ever so week Thousand-Eyes Idol in your deck, than you can throw in a couple FMRMs (Fusion Material Replacement Monster). With the upcoming release of Magicians Force containing the X/Y/Z Fusion Monsters that DO NOT require Polymerization or Fusion Gate, you can use the FMRMs to get the insanely powerful YZ-Caterpillar Dragon, XZ-Caterpillar Cannon, XYZ-Dragon Cannon and XY-Dragon Cannon out onto the field ALLOT quicker than waiting till you have the right monster(s) in hand or on the field. So if you do plan on running a XYZ-Deck than it would be worth using Versago and the other FMRMs to get the Fusion Monsters on their rampage in just a turn or two. I know not many people play Fusion Monsters at the moment but this next set may change allot of peoples perspective on them and their speed, so wait and see how many people in your area start looking to trade for some TP1 & TP2 monsters that you may have forgotten about, I know I'm holding onto my only Mystical Sheep since it's the only FMRM I own at the moment. ArtWork: 2.5 - An evil looking monster if I've ever seen one, but even with its wraps and straps this monster can destroy much more than a Sangan. You can substitute this card for any one Fusion-Material Monster. You cannot substitute for any other Fusion-Material Monsters in the current Fusion. With the coming of Dark Paladin, Versago and the other fusion substitutes should see a lot more play. Getting Dark Paladin out without any fusion subs is a very difficult task. That's where Versago and others like him come into play. I chose Versago because he's 3 stars (to get under Gravity Bind) and he has a Dark attribute. With all the Mystic Tomatoes running around again, it makes it easy to get Versago onto the field. You could even use Last Will if you were so inclined. There are some other neat fusions you could use him for like The Last Warrior from Another Planet but if you're going to go through the trouble of summoning a fusion monster, might as well make it the most powerful one. In the set after Magician's Force, there's also Black Flare Knight, a fusion between Dark Magician and Flame Swordsman which should see some play but if you're going to use Dark Magician plus a fusion substitute, Dark Paladin is the way to go. Well, 1100 ATK isn't going to win many contests.. Wow, he can suicide himself to kill a Witch! Sinister Serpent is no match for Versago! Anyways, he's not really for attacking (or defending) unless you have nothing else. If you were running a Black Skull Dragon deck, with all the fiends you probably have in it, you could probably use him as Dark Necrofear food as well. Versago is a pretty useless card unless you're running fusions. He or other fusion subs are absolutely necessary in any fusion deck with fusion monsters that allow fusion subs.